Is the Spanish Bullfight Dying? 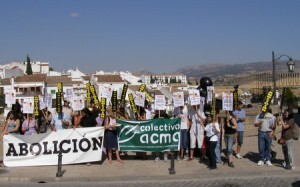 “¡Abolición!” shouted the banners and placards. Abolition! Adorned with drawings of youths on all fours with barbs in their backs spurting blood they were held aloft by about thirty protesters on the Tajo Bridge in Ronda, fifty kilometres from Marbella in eastern Spain. “Abolish the Bullfight”, they cried with Ronda’s most important fight of the year beginning in a few hours. The protesters, mostly young Spaniards, were watched by a squad of Riot Police and bemused passers by. ‘Is the bullfight dying?” I asked Paco, a regular in the Bar Maestro, a small place, serving some of the best tapas in town. Named after Antonio Ordóñez, a native son, and many say, the greatest matador ever, his loyal admirers foregathered there with other aficionados of the bulls. ‘No, the bullfight is not dying,’ said Paco banging down his glass on the counter. ‘You cannot get a ticket for the corrida this afternoon, did you know that?’ Paco glared at me and muttered under his breath. I was mortified. How could I re-establish my bona fides with this much respected man? ‘I was fortunate to see el Maestro fighting five times in the 60’s,’ I said. He looked sideways at me. Other heads nodded, voices approved. But Paco raised his glass to some memory of is own. The figures were dramatic. Over the past thirty years interest in the bullfight has fallen from a high of 55% in 1971 to 46% in 1980 to today’s figure of 28%. ‘Please Lord, let me catch a gringo.’ Even Paco laughed at that. Paqui, Rafa’s wife brought out small dishes of paella. Good humour, never far away, was restored. I was honoured to be included by these aficionados. “Death in the Afternoon”, Hemingway’s classic on the bullfight, introduced many of us to it. This ritual of danger and death, bull running or fighting is central to most annual ferias in towns, villages and cities throughout Spain. 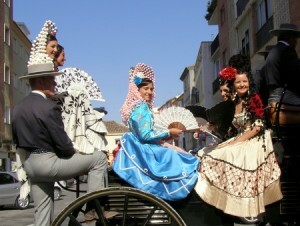 Pamplona in July, Ronda in September and Seville at Easter are the most popular. This year in Ronda the annual September shindig was in full exuberant swing, the town in an uproar. Crowds milled about; flamenco and the whirling, laughing music of the Sevillana dance blared from temporary and ear-splitting loudspeakers outside the bars. Girls and women of all ages twirled, arms twisting sensuously, fingers coiling, heads thrown back, in dramatic pose. Men and boys clapped the rhythm, shouting ‘¡Olés!’. Ronda, the birth place of the modern bullfight, celebrates the Goyescas, a festival of bullfighting so called as the participants parade in the garb of Goya’s era two centuries ago. Horse drawn carriages with decorous young girls in colourful finery, process through the streets. Men and youths in the Andalusian style of tight trousers, waistcoats and Córdoba hats stalk about on tall horses before the fights begin. Like reading Macbeth before going to the theatre, an understanding of the bullfight beforehand enables one to comprehend if not approve. Sadly many of them descend into a crude despatch of the animal, the bullfighter being booed by the crowd. But if one experiences, as I did, the gut wrenching, frightening emotion of a great matador’s performance, as Ordóñez delivered to spellbound audiences it will remain etched in one’s mind forever. 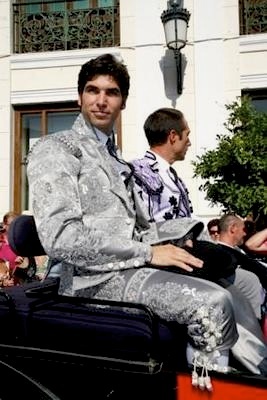 It costs over €100 000 to stage a corrida with a top matador’s name. They command huge fees and have expensive lifestyles. Cayetano Rivera Ordóñez, the Maestro’s grandson, appeared this year in a Suit of Lights, as their costume is called, made by Armani. A whiff of decadence, a foretaste of the fall? The rivals for the public’s Euros are football and basketball. Spain are the current European Champions in both sports. Tennis and golf have attractive role models also. Nobody in the bar had been prepared to challenge Paco. But the newspaper’s figures would not leave us. None of us was under fifty-five. And so it is throughout Spain. The corrida is dying with its ageing followers. No doubt in the midst of the recession, they were thinking of the over 100,000 people employed in the industry and the turnover of 1, 5 billion Euros a year. Despite the two thousand year old tradition going back to Roman times, leading opponents of bullfighting recently took their cause to the Spanish parliament demanding an end to it. Parliament is currently debating a draft law on animal rights. How bullfighting will escape such a charter I do not know. The League Against Cruel Sports is increasingly active. The Spanish public broadcaster, TVE, announced that it will no longer broadcast corridas. Two years ago, Barcelona declared itself an “anti- bullfighting city”. The closure of the last bullring in Catalonia highlights its political ‘independence from Madrid ’. However, in Madrid and the southern province of Andalusia the plazas are often filled to capacity. Bull fighting is deeply rooted in Andalusia. Like everything else the Andalusians do they do it with passion. It’s as though they had the caps lock key permanently in the ‘on’ position, the stereo at its loudest. It is in this intense, emphatic and above all passionate atmosphere that los toros, the bullfights, persist, its great exponents revered. But the inevitable is coming. There will be more protesters. Just as Picasso and Hemmingway supported the bullfight, new names will support the Abolitionists. I see in my mind’s eye a dusty road in Spain trodden by a gaunt figure in rusty armour on a spindly steed followed by a podgy fellow astride a donkey. One almost sees the white sails of windmills that will surely attract the attention of that wandering knight. For it is none other than my demented hero, Don Quixote de la Mancha and Sancho Panza. Is it the youngsters on the bridge who are tilting at windmills in the battle of the bulls? Or Paco in the Bar Maestro? Article written by Bearnard O’Riain, a published author who has written an autobiography ‘Running to Stand Still‘, an account of his years as an angry and abusive husband. These days Bearnard runs the MURAL support group which helps other men recover from abusing their spouses and families in Johannesburg’s northern suburbs, including the infamous Alexandra township.